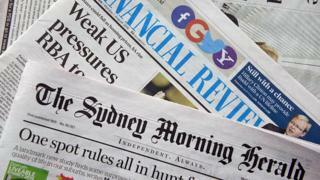 The owner of Australian newspapers including the Sydney Morning Herald is in takeover talks with a North American private equity consortium. TPG Capital and the Ontario Teachers' Pension Plan want to buy parts of Fairfax Media including its newspapers and property advertising arm, Domain. A deal could be worth as much as A$2.5bn (£1.4bn). However, loss-making Fairfax said the offer "may not optimise shareholder value". It also said the proposal may not get off the ground "given the complexity involved in splitting the businesses". A deal would also need approval from the federal government's Foreign Investment Review Board. Fairfax, which also publishes The Age and the Australian Financial Review, posted a loss of A$893m last year as it struggled with plunging print advertising revenue and newspaper sales. Last week journalists at the Sydney Morning Herald and The Age in Melbourne went on strike for a week in protest after management announced more job cuts. However, the Domain division, which accounts for half of Fairfax's profits, is growing strongly and the company wants to spin it off and retain a majority stake. Domain is Australia's second-biggest real estate website after one owned by Rupert Murdoch and is valued by analysts at about A$2bn. According to Fairfax, the consortium has offered 95 cents a share for Domain, along with the metropolitan newspapers, an events business, and a start-up investing arm. That would leave existing Fairfax shareholders with assets including newspapers in regional Australia and New Zealand, as well as stakes in the Macquarie Radio Network and Stan, a video-streaming service. Shareholders would also be left with existing debt. Lee Mickelburough, of Henderson Global Investors, which owns about 5% of Fairfax shares, said: "It's a troublesome structure to say that we get 95 cents for the good business and you get to keep the debt for the transition businesses. It's cheeky, the way they've structured it." Shares in Fairfax gained 2.4% in Sydney on Monday following news of the bid, valuing the company at about A$2.5bn.